Backcountry Snowbike Tours - Combine a snowmobile with a dirt bike and what you get is a snow bike - lighter more maneuverable and rides like a motorcycle in snow! What is a snowbike? – A Dirt Bike on Snow! Its a NEW Sport! A Snowbike is a off road motorcycle with the wheels removed and replaced by attaching a front ski and rear caterpillar track. The first broadly available commercial snowbike product was created by a company called Timbersled as recently as 2010 – and hence the term snowbike and Timbersled are often interchangeable…. 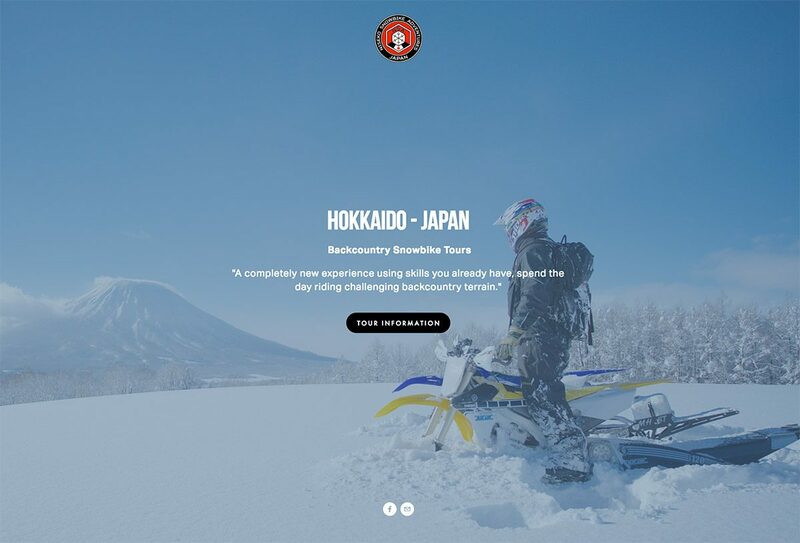 Niseko Snowbike Adventures uses snowbike conversion kits from both Timbersled and Snow Yeti MX mounted to the leading brands of 2016/17 Competition Specification 450cc Enduro & Motocross Bikes. Ideally suited for Intermediate to advanced on-road or off-road motorcycle riders whose skills are directly transferable to riding a snowbike with about 15-30mins of practice. This allows guides to quickly gain confidence in each riders ability to access challenging terrian for a true backcountry experience. All tours operate from our Kanbetsu base, 15 minutes north east of Hirafu, riding the Yamanashi range, elevation is between 500m -1300m. Mid winter tours usually ride within a 40km2 area from the base, spring tours can range significantly further. Group Size – Min 3 / Max 5 (Individual or private bookings by arrangement). 2016 / 2017 High Spec 450cc Snowbike. Hot drinks and small lunch pack. Snow boots can be issued if your footwear is found to be unsuitable. A limited supply of spare googles and gloves are taken on all tours. Quality Ski Wear – Dress for med / high activity… however there will be periods of inactivity for breaks / lunch etc where having an extra layer may suit some people. Snow Boots – Soft Snowboard boots are acceptable / Ski boots are not.